I really love this job, and I know for sure that all marine biologists feel the same. However I sometimes get the feeling that most of the students and young “marine biologists to be” do not quite know the real meaning of being a marine biologist. Recently we had the amazing chance to have young Seychellois marine enthusiasts to join our team based at Four Seasons Resort Seychelles. Fred from Island School Seychelles, a Save Our Seas Foundation project, spent a week with us, while a group from the University of Seychelles joined us for a day. It was a great experience both for them and for us; we had the chance, through the eyes of these young students, to realise just how much work we carry out, how many skills are required to accomplish our daily routine tasks, and how little people generally know about what the job really entails. And that inspired the subject of this blog! There is no denying that it is true, this is one the best jobs in the world. We often live in breathtaking places and sometimes we do have the chance to get close to amazing marine creatures. But, the glamour is just a part of the story. Generally the smallest part! Despite what people think, swimming with dolphins is not exactly what all marine biologists do. It’s like judging a book by its cover. 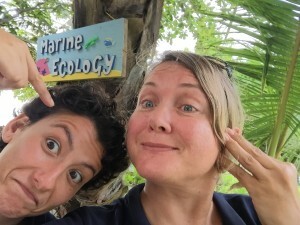 So, together with my colleagues, WiseOceans Marine Educators Jo and Charlotte, we decided to make a list of the things you don’t know about this job. So, here it is, our top nine things you never knew about the life of a marine biologist! Marine biologists have to study a lot to get where they are. And they keep on doing it. All life long. All. Life. Long. Marine biologists are super knowledgeable professionals. Most of them have a degree or two, often a Masters and a PhD. They have spent an age in the university library; while the rest of the world was clubbing, playing football, singing, they have learned to appreciate the “wonders” of chemistry or a math formula. And, if this is not enough, they know that they will keep on studying for their entire life if they want to keep up with the pace of science. Something to think about before you enroll in a marine biology course – the studying is for life! Marine biologists spend more time with their laptop than their wetsuit. Field work can be glamorous and fun, but what those amazing National Geographic documentaries do not show is that field work is just a small part of the game. A marine biologist’s best friend is not a dolphin, not a colleague, not a starfish, but his or her laptop. Always on marine biologist’s side, on the beach, under the sun, with 33 degrees, full of sand, these laptops are invaluable tools and the companion of many adventures! Marine biologists are obsessed with data collection and data analysis. 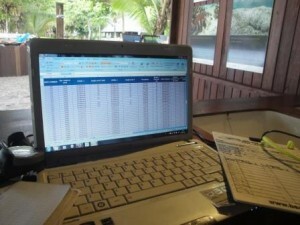 Databases, statistics and excel are an integral part of marine biologist’s daily life. What else can I say? That’s it. In most cases, over the years they also develop a pretty crazy passion for it. Yes, we do get excited about data; some kind of weird survival instinct perhaps?! Marine biologists work in harsh conditions too! As much as we would like to tell you that the life of a marine biologist is filled with all-year round sun and crystal clear waters, we know from first-hand experience that field work can mean being freezing cold, lashed by the rain and seasick on a boat for hours at a time. Not to forget that studying the sea could mean also studying the Artic, the Baltic Sea, the Irish Sea and so on! And anyway, even those who, like us, are working in tropical waters sometimes have to face bad conditions: storms, monsoons and rainy seasons are just as much a part of the game as sunshine. 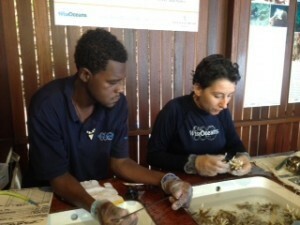 Marine biologists are simple people, driven by passion and dedication rather than anything else. If you want a career in marine biology because you think you are going to be featured on David Attenborough next series and make lot of money, think again. Many opportunities, especially at the beginning of our career, are voluntary and their purpose is only to gain field work experience. And even later, the money is the last thing marine biologists look for when they pick a job. Did we mention the amount of time spent on databases, R and excel?? Style is not and cannot be a marine biologist’s priority. For those working in the tropics, the sun will play havoc with their skin and hair, and staying stylish can be a challenge. Plus you don’t have time anyway! Marine biologists really can save the planet (one step at a time). Their research, their passion, their effort in sharing their knowledge about marine life can shine a light on different ways to save it and really inspire the change. Some, like us, truly are lucky enough to work at least for a part of their lives in beautiful tropical locations, diving and snorkeling with sharks, mantas and schools of fish everyday. Being a marine biologist means meeting a lot of interesting and inspiring people from all over the world. Marine biologists know that everybody is envious of their job, even if those people don’t really know what it means! View from my office this morning! And if you STILL want to be a marine biologist, take a look at the Wise Work section of the WiseOceans website, full of marine conservation jobs, expeditions, internships and courses. 49 Responses to So you think you want to be a marine biologist? Hi Hannah, well not all marine biology work takes place in the sea – there’s plenty of research done in research labs and offices. However, you might be missing the best bit! We are not sure exactly what scares you about the oceans but firstly, we would suggest that you feel confident as a swimmer – perhaps get some lessons. 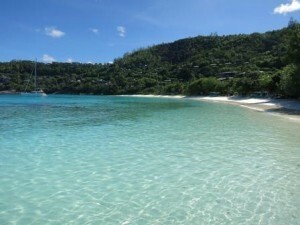 Then it is a case of practice makes perfect and gradually introducing yourself to the wonders of the underwater world. Make sure you have a good ‘buddy’ with you who can support you and knows the area/conditions. It’s also a good idea to learn more about the creatures that live in the sea – you’ll find out that they have a lot more to fear from us than we do from them. We hope that helps! I have always dreamed of being a marine biologist. I am 24 and planning on starting college soon. I love the thought of traveling and studying for the rest of my life. i am not scared of sharks are anything like that. but do i need to study tne whole ocean or the creatures in it. how many years of college do i have to go through. i would really appreciate it if you recommended any colleges or universitys. Hi Morgan. Pretty much all university courses start out broad and then you specialise as you go on. It is pretty unlikely that you will study ALL the creatures in it though! There are just too many!! Most undergraduate courses are 3 or 4 years long. It is hard to recommend a course for you though as each one can have a different focus. We recommend spending lots of time looking at their websites and visiting as many as you can in person. This website is amazing. I really love the oceans and love going snorkeling and scuba diving. I didn’t know Marine Biologists had to go through all of this, but I still want to be one. This website helped me learn more about marine biology. Thank you so much! Hi do you know what I have to apply for if I want to get a job in marine biology (eg what courses to take) and after you get a degree how do you actually get a job as a marine biologist? Thanks! 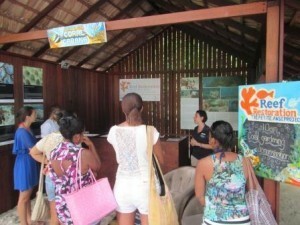 Dear Kiara, Our ‘Interview with WiseOceans‘ series is a great place to start. You’ll see the different ways people have forged their careers. For the most part, marine biologists study biology/marine biology/zoology at college/university, but as you’ll read in the interviews it is essential to get lots of practical experience before, during and after your studies. Our Wise Work pages have lots of examples of volunteer opportunities/internships and jobs which will give you an idea of the kinds of qualifications and experience people are looking for. Good luck with it all! So I wanted to be a Marine Biologist but I don’t know how to swim due to a trauma of almost getting drowned in the pool when I was young. However, due to my love on the oceans, marine animals and saving them, I want to overcome that fear but it’ll be a little while before I face that fear. What should I do??? P.S. I love this blog A LOT!!! Hi. We are glad you love the blog and it is great that you love the oceans. Overcoming the trauma of nearly drowning is a little beyond our area of expertise but I’m sure there must be professionals out there who can support you. Perhaps some 1-2-1 lessons with a qualified swimming instructor who has experience in this area? We hope that you do find a way to confidently get in the water and enjoy the incredible sights of the underwater world. I was searching for info about what Marine Biologists do. I have a nephew who says he’s thinking about this career field. I will be seeing him next month and after read this info I’m confident I have enough info to have a great conversation with him. Thank you. I’m not entirely sure what you mean by ‘after 12th’. However, I would point you in the direction of our ‘Interview with WiseOceans’ series, which has interviews with over 70 marine conservation professionals, discussing their career path and the skills needed. Our Wise Work pages also have lots of volunteer opportunities and internships, perfect for getting the kind of experience you need for getting a job in this area. Finally, sign up to our Weekly Job Alert email which brings you all the latest opportunities and positions straight to your inbox every Wednesday. my dream job since i was little has always been to become a marine biologist but I’m awful at maths, to go far is maths something that has to be a strong point and what maths is required? Also I’m in year 10 and i don’t know what subjects to choose to bring me in the direction i want to head, have you got any suggestions? Maths is certainly part of studying marine biology. Statistics, for example, is very important for helping to understand the data you might collect for an experiment. You need to do some research about what universities require for their degrees. Some will want advanced study in maths (A level for example) and others will not require it. Most will want to see you’ve studied a range of sciences, including of course biology. Perhaps speak to a careers advisor at your school and/or see what additional help you can get with maths? We wish you all the best in whatever you decide to do. Great! Good luck with it all. I want to be a marine biologist and I am currently a sophomore in highschool. I am graduating highschool early to have some extra time to see if marine biology is really what I want to do in the future. I love this blog and I just wanted to know bout how long would it take for me to finish up all of college and if I can jump straight into the marine life right after college. Hi Emma, Most marine biologists study for their undergraduate degree which normally takes 3 or 4 years. Many also choose to do a masters degree (1 or 2 years) but not necessarily straight afterwards. Getting practical experience is key – both to see if you really want to do this and also to help you land a job. Many people don’t immediately start with paid employment straight after college (some do of course) but get further experience in internships, expeditions and volunteer positions. I recommend reading the link at the bottom of the blog – they will give you lots of great advice. Good luck! Your article was very helpful! I’m interested in marine biology, and am weighing up career options in a variety of fields. Actually I’m kind of struggling with my decision haha! Marine biology does interest me though, but I’m a very wary person. I’ve almost always been terrified of water (it’s the ebb and flow I seem to have an issue with, as well as not being able to touch the floor), and I’m wary around a animals I’m unfamiliar with (which will probably be fixed upon learning about the creatures). Should I still pursue a degree and career in the field, or do you think my fears will get in the way too much? Hi Shannon. Thank you for your comment and we are glad you like the article. As I’ve mentioned in other replies, not all marine biology happens in the field and not all fieldwork happens in the open ocean, so there are lots of options for you to pursue. Certainly, gradually getting experience in the sea, in the company of experienced or professional swimmers/divers might help you overcome your fear of the ocean and learning more about the amazing animals in the ocean will definitely help you assess the relative risks from them. I hope that’s helpful and good luck with whatever you decide to do. (or do you know some)? Do you know the cost of researching/studying animals? Do you know (or can you figure out) the time and effort it takes to research animals? Thank you for taking the time to read this, I look forward to hearing you soon. Hi Ben, Thank you for your questions. I’m slightly struggling to answer your questions as they are quite vague. Animal research takes many forms so the cost, time and effort vary enormously. You might do this as part of a degree or post-degree research or you might work for a conservation NGO who run the research. The research might be in a lab or in a super expensive research ship (and everything in between). In terms of the benefits of studying animals – again I’m not quite sure what you mean. Generally speaking, the more research that is done on a species then the more we know how to protect it and ensure its future. From a human perspective, working in a field where you feel you are making a difference to the well-being or future of an animal is very rewarding and gives a really positive focus to your working life. I hope this is useful to you. Hey there! So, I was raised on a Salmon Hatchery, run by two head marine biologists. Growing up I was interested in Marine Biology, but we moved in my mid-teens, and I never got to fully investigate the different fields in the career. I’ve now completed a general associates degree, and am interested in pursuing something similar to what the two biologists at my old home did. Hatchery work and studying Chinook Salmon. Is there a specific area of study or branch of career I should research into that would help me do this? What type of job would that be called? I’m more searching for job titles to investigate what branch of marine biology I would be most interested in. It’s hard to look for info when I don’t know what I’m looking for! Also, as an 18 year old with high school diploma and associates in hand, how difficult would it be, to get into a good MB program, in your opinion? Hi Allexis, Thank you for your question. It’s great that you want to get into marine biology. I would firstly recommend that you work towards getting your Batchelor’s degree – this way you get to explore lots of different areas of marine biology and really know what you want to do (there are SO MANY different areas. I must confess the US education system is not my area of speciality so I can’t give too much specific information here. In terms of job titles, you are generally looking at fisheries jobs e.g. fisheries observer. Marine biology degrees and jobs are fairly competitive so getting as much volunteering/internship experience wherever you can is essential to help you stand out from the crowd. I hope that is helpful to you. I have wanted to be a marine biologist since I was a little girl. I was always obsessed with the water. Unfortunately I had many problems with my hearing and going underwater only made things worse. The doctors couldn’t do anything and under his advice I stopped working towards a career in marine biology because I wouldn’t be able to dive. Was this a mistake? Could I be a marine biologist that doesn’t dive? There are indeed many career options in marine biology that don’t involve diving. In fact, this blog serves to highlight that while working in-water is an attractive element to working as a marine biologist, there are many types of work that are office/lab-based that marine biologists spend their time doing – research, marine education, fisheries, policy work etc… You don’t have to be the one going underwater to be involved or lead the research. If you read through some of our interviews with marine professionals you will see there is a wide variety of careers. If you can snorkel (as opposed to diving) this could also open up some opportunities. So if you still want to be a marine biologist, don’t let not diving put you off. There will some restrictions to accessing some opportunities but with some creative thinking, there will be options. Hi I am really interested in study marine biology and ocean sciences in general and I know this is a silly question but during field studies can marine biologists get attacked/bitten by other sharks or sea creatures that could have life long impacts/ injuries. Thanks I still don’t know a lot about Ocean sciences and Marine Biology but I am doing as much research as I can to see if it is something I want to do. If you are working with wild animals then there is always the risk of injury – whether it is marine or terrestrial life. The reality is that incidents like this are extremely rare. The more you learn about marine creatures the more you will learn that they have much more to fear from us that we do from them. I personally don’t know anyone that has been bitten by a shark or even come close. In reality, the more dangerous things in the oceans are things that you might accidentally touch like jellyfish, urchins and some types of shells – even then, as you develop your in-water skills, you can minimise this risk. So, there is never ‘no risk’ but you will learn that the risk is low when you follow appropriate advice and protocol. It definitely shouldn’t put you off following this career route if that is what you are interested in! Hello, I am very interested in marine biology and I am in the 10th grade. Do you know of any activities that I could do in high school to increase my chances of getting into an MB program for college and also which ones you would most recommend? I am also very interested in environmentalism and wondering which field of marine biology would best suit my interest in the subject. How great that you want to be involved in marine biology. I am not an expert on the High School system but ensuring you have good grades in all the sciences (especially biology of course) and maths would be essential. Marine Biology is a very competitive field so adding lots of practical experience where possible can help with your application. Find volunteer/internship opportunities in your area, go on a related expedition during a vacation etc… We have lots of interviews with marine conservation professionals which you might find useful/inspiring. Also, keep an eye on our Wise Work pages for opportunities that will help your application. I wouldn’t worry too much about which area of marine biology yet – your undergrad course should expose you to a variety of subjects and fields which will help you focus on what you want to specialise in. Hi Charlotte. Just recently, the idea of becoming a Marine Biologist has been distracting me quite a bit, especially since I started diving. Thing is, I’m 22, didn’t do well in high school, took a few years off, and am now enrolled in a 1 year culinary program. I’ve considered finishing the 1 year and taking the plunge into University for marine biology but because of my spotty past with academics, I’m doubting myself pretty hard. I’ve been doing really well since going back to school but I understand that the course I’m in now is nowhere near as difficult as a marine biology program ought to be. My big question is, would someone like myself be fit for such a course? And are there any sort of prerequisites or things one would need to learn before even applying? I’m currently learning the basics of Excel at school, but I have no knowledge of R, nor do I know much about programming in general. I assume such things would be taught in the first year, but the prospect of locking myself into a 4 year program is kind of scary, so I’m trying to arm myself with knowledge as best I can. Dear Ryan, It is hard for us to say whether you will stick with a course or not however if you are interested in a career in marine biology then studying it an university is normally part of the journey. That said, I know many people who have chosen to formally study later on in life having taken part in lots of practical experience before hand – expeditions, volunteer opportunities etc…Perhaps taking part in something like this would confirm for you that this is something you really want to study and stick to? I wouldn’t worry too much about R etc…this would all be part of a under graduate course, depending on the type of course you choose – prerequisites etc… would also vary according to the individual course you apply to. I hope that is helpful in some way. Hello, I am a passionate of the marine world and have the intention to pursue my studies in marine biology. However I suffer from astma and wanted to know whether it will be a problem as a marine biologist. Thank you! Hi Ismah, I’m afraid we are not medical experts so we can’t give you personal advice on this matter. I would encourage you to find out more from your doctor. In terms of diving, then organisations such as PADI have guidance on what medical issues can impact on diving which you can take to your own doctor. As we’ve mentioned in several other comments here, not all marine biology happens underwater so if you couldn’t dive it wouldn’t necessarily stop you from being a marine biologist. Of course some field work needs to be underwater and some of this happens in remote places, where medical help can be hard to get to quickly so it is important that you get good medical advice on this. I wish you all the best in your future studies, whatever you decide to do. I am in 6th grade and I have a love for marine life, biology and science. Ever since I saw movies about marine life I was fasinated by it. But, my grades aren’t to good and go I was wondering if my grades now would efect them later? Hi – Not everyone does well in school to start with but it is never too late to improve! Finding what you are passionate about can be the incentive to work harder. Most degree courses will be quite competitive so good grades will be important – but the exact grades will depend on where you apply. The best advice we can give you to is to keep trying, get all the help you can and put your passion for marine life into all aspect of your studies. Hi my name is Bella, I’m in secondary school year 10, I have always loved marine life since a young age and have wanted to be a marine biologist since year 6, it inspires me so much just one job can change the world for the better. I am taking my GCSEs next year is there any pacific grades I need to achieve to get to this goal? I also have a type of autism , Aspergers, would my condition effect me getting to this goal of becoming a marine biologist? Hi Bella, We love that you want to be a marine biologist. In terms of GCSE grades then you really look at what grades your 6th form college will need to study A-levels like biology and maths. You then need to look ahead to Universities to see what kinds of A-levels they need for a marine biology degree (this is often biology, maths and other science subjects). Your school careers guide should be able to help you with this. I don’t know enough about you and Aspergers to give you very specific advice but I would say that marine conservation and marine biology would benefit from having lots of diverse people in it – like any job. So I would seek out as much support as you can get and use your passion for the subject to get towards your goal. Hi. I’m 14 and i’ve just recently recognized my interest in marine biology. I’ve read quite a lot of articles to get an image of the job . I’ve always been interested in marine life , corals and such and i would definitely want to spend my life underwater or researching and helping with the marine life . My friend who’s dad lives in the maldives is a marine biologist and spends his time underwater doing his utmost to save the corals. I also want to discover more about the sea life and read books , get more knowledge. Sad to say but i struggle in math. Also , i’m in the french system , so i don’t have a variety of choices when it comes to taking courses or classes that could lead to getting in the field later on .i also fear that my lack of performance in maths and physics could affect my choice . I know marine biology isn’t just about swimming with sea animals and being in beautiful places , at the end of the day the job is about helping marine life and wanting to learn more . And that’s definitely something i want to do. Any advice ? At 14 I don’t think you need to worry too much about choosing specific courses or classes just yet but you are right an understanding of maths supports most science degrees. So working hard in this area and getting all the support you can is a good idea. It might not be the thing you are best at but improving it will definitely help. You can give yourself some idea about what universities are looking for by searching for marine biology courses in Universities in your country. That might give you some inspiration. You seem to have a good understanding of what marine conservation is so that’s a good start! All the best with your future studies. Hello! I loved this article and it was definitely very helpful. I have always thought about becoming a Marine Biologist pretty much since middle school(I am 22 years old now). I am in my second semester of community college and am just still very unsure of what I want to do. I am thinking about Environmental Science but am just not sure. Math has always been my worst subject so I am definitely just nervous about that. What kind of math is required? Also I have read many articles that it’s not even worth going into Marine Biology because of how little the job growth is and how extremely competitive it is. This is definitely my dream job but am just very unsure about job security and math skills. Any advice would be amazing. Thank you so much! Hi Shannon, It is true that getting paid work and a secure career progression in marine biology is a challenge – but that doesn’t mean it is impossible! You need to really want to do it though. That said, it is a wide field and not every marine biologist is cruising the oceans collecting data and diving with dolphins! So there are lots of different options – with different levels of job security. Our Interview with WiseOceans series is a great place to explore the different kinds of jobs and roles – alongside how to get them. In terms of the math you need – again that would depend on what kind of marine biologist you become. Some roles will require quite advanced math and others, not so much. It may not have to be your ‘best’ subject but worthwhile putting in the effort to do as well as you can. In general, you find people recommend that having good skills in statistics is a useful skill to have. I hope that was helpful and good luck with everything. Hola, since when I was child the ocean never failed to captivate me leaving me with a sort of pull towards anything related to it. i always wanted to work in a filed that would allow me to study wild animals whether medically or in conservation, I recently transferred universities and major from animal science for veterinary medicine to marine biology, I’m still not sure in what I would want to specialize (I’m 21 3rd year college) I was wondering were would it be a good start to gain experience and if marine biology could also include studying how the ocean floor volcanic movements affect the nutrients available to the sea which in turn affect the food pyramid, along with how human interaction whether directly or indirectly affect the oceans ecosystem. Hola Fernanda, Thank you for your message. I would definitely recommend getting as much experience as you can as soon as possible. Marine biology/conservation is a very competitive field so being able to stand out from the crowd is important. I would recommend reading these two blogs (15 Skills to help you stand out from the crowd and Top five pieces of advice for a career in marine conservation as well as our Interview with WiseOceans series so help give you an idea of how to build your career. In terms of ‘what marine biology includes’…this is a big question to answer, especially in this forum. Marine biology is linked to oceanography and other disciplines and inter-disciplinary work is very important. I would suggest you speak to your professors and tutors at college to find out more. Hello! I love this article. I’ve just recently started a smart start course at UWA, so that it can help me get into a marine biology course next year, what kind of laptop would you recommend for study purposes? Hi Keira, It is great to hear you’ve started your studies. We are not IT experts here but we have staff who have used both Mac and Windows laptops for their studies. These days I don’t think it matters. We have had, on some occasions, some issues in small programmes only being developed for Windows laptops and not Mac but this has not been a major issue so I would go with whatever suits you best.